Heathcare Facilities are moving to a new philosophy, fostering wellness by providing natural environments that help promote healing for sick patients. 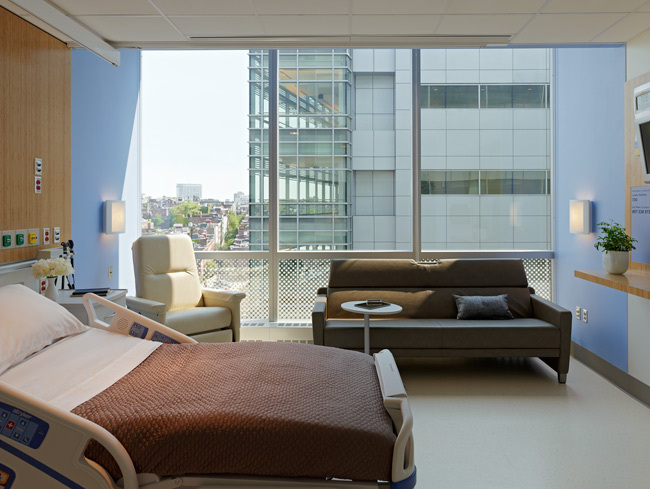 Massachusetts General Hospital features a floor to ceiling, glass atrium with live hanging plants that are viewable through patient recovery rooms. Natural materials are incorporated into the interior design for aesthetics and because of their low VOC properties. Massachusetts General Hospital Lunder Building is a tribute to a growing commitment to environmental construction. More than a third of all the materials used for construction were recycled or locally extracted or manufactured materials. Quickly renewable materials, such as bamboo plywood, was utilized further reducing environmental impacts. Plyboo® is proud to be one of the products that enabled Mass General to achieve Gold certification by contributing LEED credit points to the project. Plyboo Edge Grain Amber plywood was chosen as the product of choice for its FSC certification for sustainable forestry and for its low emitting SoyBond adhesive which is 100% formaldehyde free. Over 1000 sheets of plywood were fabricated into wall cladding and shelving for the patient recovery rooms, benches and featured wall seating in the public spaces, and veneer on the sub-level radiation doors.